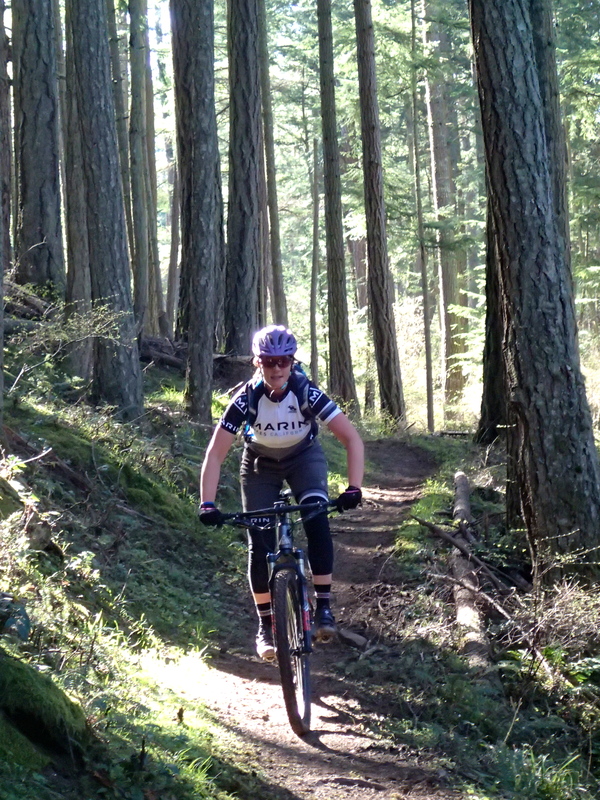 The best trails in Moran State Park on Orcas Island are open to mountain bikes only from September 15th through May 15th. With the balmy, dry Pacific NW winter, we decided to make an early spring trip up there. Trail conditions were prime, and the weather was perfect. The Marin Rift Zone was the perfect tool for the job. The 29″ wheels with Schwalbe Nobby Nics and 120mm front/110mm rear suspension were perfect for tackling the varied terrain – sustained climbing on pavement, then steep, sometimes loose single track, followed by a whizzing fast descents that were occasionally rocky and rutted. The first day, we took “the direct route” to the top of Mt. Constitution, which was about 12 miles, 2,700 ft of elevation and 2 hrs of ride time. Day two, we took a longer route up and over Mt. Pickett, which felt like it climbed interminably. It was only a few miles more, 15 miles total, but with a 3,800 ft elevation gain we were in the saddle for 3 hrs. By the end of that ride, I was convinced that I’d swap out my 32-tooth chain ring for a 30 on my 1×11 set up. I spent a lot of the day grinding up hills uncomfortably perched on the nose of my saddle. 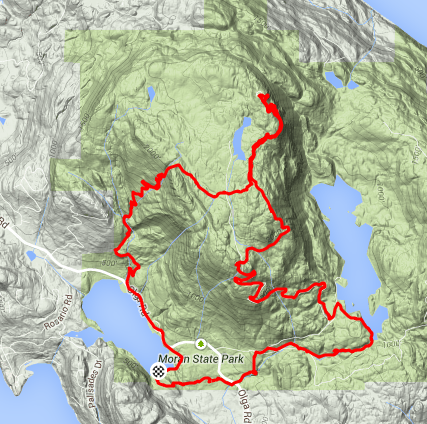 We had camped at the Mountain Lake Campground in the past, but were lured to the South End Campground of Cascade Lake because of the hot showers and better wind protection. Surprisingly, it was the less crowded of the two campgrounds. It’s a luxury to be able to start your rides directly from camp, and then return to a hot shower, warm sleeping bag, and cold beer. Important note: Off season, all of the restaurants on the island are sadly understaffed or closed. Most places were only half full, but lines of customers were waiting to be seated. In a pizza joint, there were 7 customers total in the place, and the server told us it’d be at least 30 minutes for food because they were really swamped. (!) After three failed attempts, we landed at the Orcas Food Co-op. They have a deli in the back with lots of fresh, delicious offerings, and were quick to serve. I was so hungry by the time we found the place, that I shamelessly chomped down on one of their fresh baked rolls while waiting for our sandwiches. In short, I definitely recommend the place!